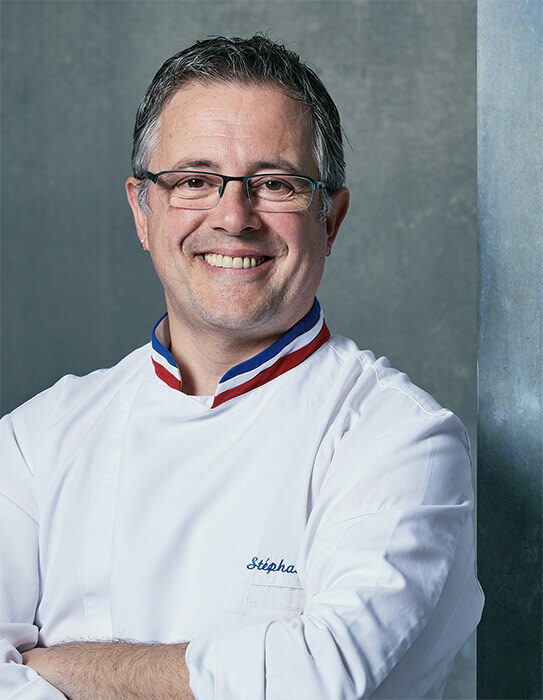 Bleu Chocolat is Stéphane Leroux’s brand-new book, now available to professionals through our online store, Books For Chefs. 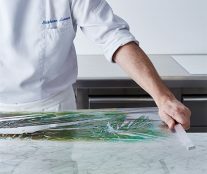 His third book returns to chocolate as a raw material for the making of artistic pieces and does so with great detail. If his first book, Matière Chocolat, marked an era and served as inspiration for hundreds of pastry chefs from all over the world, on this occasion it seems that he has gone even further to convert the repertoire of pieces, a total of 60, into an opportunity to address all kinds of techniques with which to make chocolate emulate reality to extremes in which it is difficult to distinguish between the original and the replica. Surprising, captivating, stimulating … we can think of many adjectives that go hand-in-hand with Bleu Chocolat. 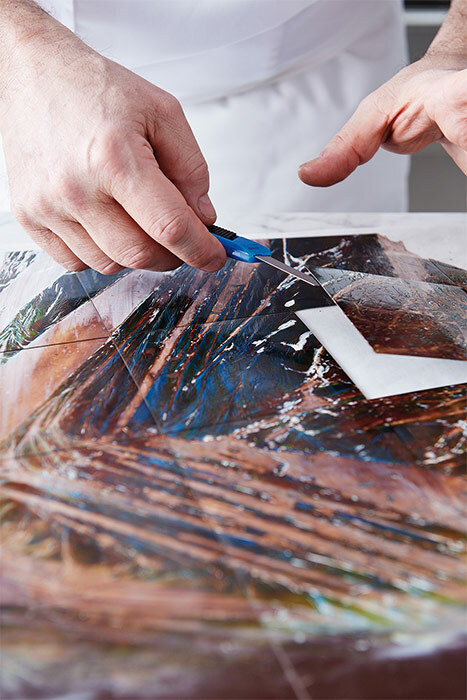 The book is divided into two volumes that separate the creations which are magnificently photographed by Tom Swalens in final pieces and in the techniques used by the French chocolatier to achieve each result. 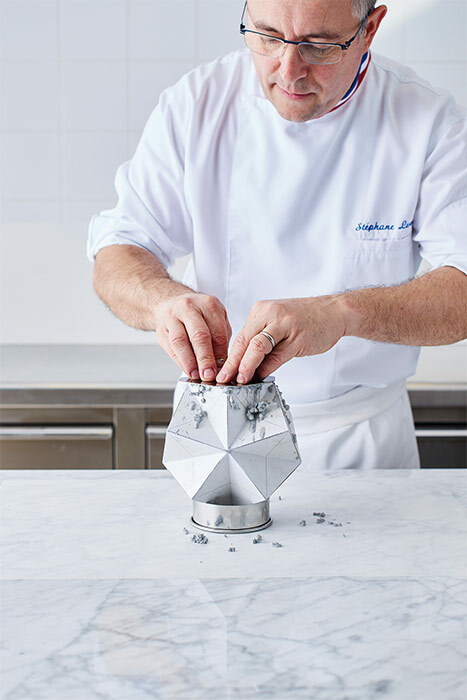 Stéphane Leroux has wanted to evolve and share his work around chocolate, redefining the possibilities he has in artistic matters. And the possibilities are many, almost unlimited. He himself strives to emphasize how much is left in between with respect to his first book, when the constructions were based on vertical montages and very recognizable styles to date in this discipline. Now it is about getting all kinds of effects related to the materials and elements of nature that surround us. 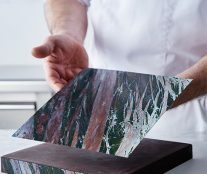 Except for crystal-clear water, almost any substance can be emulated in chocolate, says Stéphane Leroux. But far from staying in a catalog of incredible and beautifully photographed pieces, Bleu Chocolat is a technical manual of great precision. 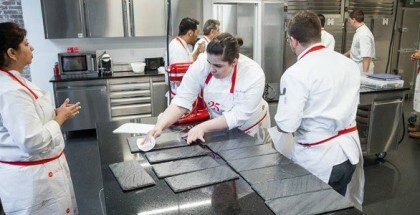 The volume dedicated to step-by-step instructions is separated into four blocks that aim to help the beginner to know the elements and techniques that will allow them to achieve each result. 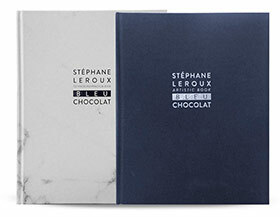 The book is published by Belcolade, the chocolates firm of which Stéphane Leroux himself is ambassador. To delve into this work, we wanted to have an interview with its author. 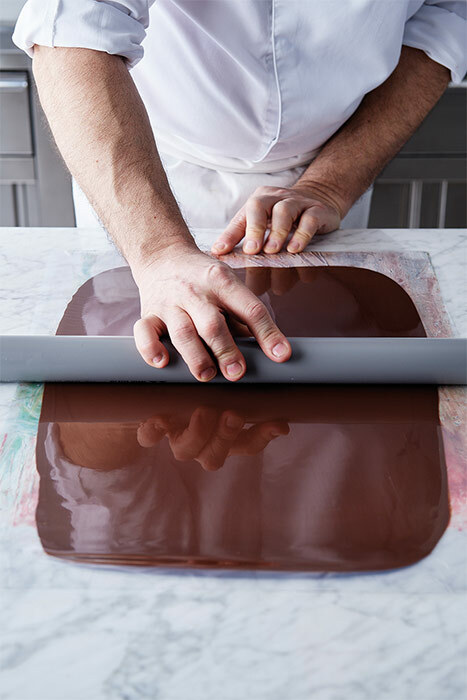 The master chocolate maker has given us a series of reflections that deserve all interest and that help to better understand the scope of this work. How long did it take you to make Bleu Chocolat? I started working on this project at the end of November 2015 regarding the text. Then we focused on all the technical photos, with Tom (Swalens) and Klaas (De Buysser) from May 2016, and finally we finished with the artistic photos from May to September 2017, that is two years of work. 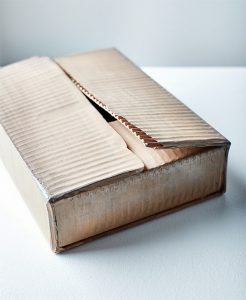 Of the three books that I have made so far, this is the one that has taken the most time and energy. To what extent is this book a 50/50 job with photographer Tom Swalens? I’ve known Tom Swalens for 20 years. In addition to his great professionalism, he brings a look at the things I love. I always want to make a book with him. He also knows very well my level of demand at work. That is why we have quickly understood the content and style of the work we wanted to display. The editors and Belcolade have placed their trust in us and we have not had any pressure during the realization of the content, with which we have been able to work with total serenity and at our own pace. Are we going to see Stéphane Leroux more often in art galleries from now on? Isn’t it scary to be changing your status as an artisan, leaving it behind? Art galleries, why not … I could still make myself known in such an area where I am only an illustrious stranger … But seriously, the work and the pieces made in the book allow me first of all to offer floral representation techniques and other effects of materials. I sincerely believe that there is a decoration “technology”, this is especially what I wanted to convey. Without transmission of knowledge of techniques and technologies a trade is doomed to disappear. The artistic pieces as such are the reflection of a perspective I have of my surroundings and to my own sensibility. They simply belong to Stéphane Leroux, my interpretation, a way of expressing myself. In my view, the technical book has more value for the reader than the artistic book, which is more personal. It is also what I try to make the professionals with whom I coincide in my stages and interventions understand. The most important thing is to appropriate a technique to achieve a result and, where possible, improve. Seeing Stéphane Leroux everywhere does not arouse any interest, I do not wish at all to create a standard … everyone has to have their own creations, with their own emotions. It is clear that nature and the objects of daily life are your main source of inspiration. Is chocolate really that versatile? Everything is possible with chocolate. The most difficult thing is to reach a point where a variety of techniques allow you to transform a simple idea into something concrete. The only material that would be impossible to reproduce with chocolate is the transparency of crystal clear water or the calm of fresh morning dew. Have you interacted with sculptors and artists who usually use other more common subjects of the fine arts? Do you feel identified with what an artist looks for in their work or does the “culinary-food” part of chocolate keep you away from them? Above all, I have checked other trades within the Compagnonnage to which I belong. 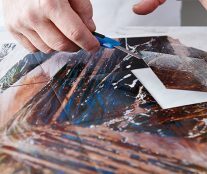 I have seen them work and at times I have tried to transfer certain work techniques from other disciplines with the materials that I use. On the other hand, each profession also has its artistic part. I have seen plasterers, carpenters, stonemasons, and many others perform their exceptional works of great artistic sensitivity without having received any artistic training … it is simply the technique in its purest state taken to its highest level. 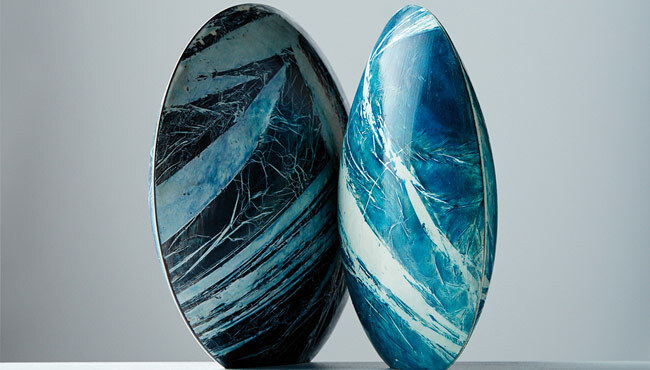 In fact, where does the artisan end and art begin? Sometimes I am more sensitive to a beautiful technical realization than to a pictorial work, even feeling very attracted to everything that has to do with art and the process that accompanies it. I have also seen professionals surrender without concessions to their work, abstracted, abandoned and lost, making sacrifices, suffering and sometimes causing suffering, torturing their spirit and putting themselves to the limit to continue working with fervor and passion to get pleasure and whose sole purpose is to make something beautiful and simply create. I express here what can sometimes be felt by a professional who is passionate about what they do, maybe it is the same for an artist. 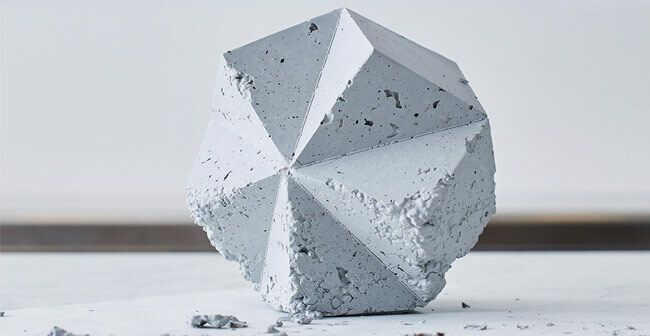 As for chocolate, I am convinced that it offers different physical aspects whose effects are its own and that would be very difficult to reproduce in other materials. What common aspects do you find between this book and your previous book dedicated to artistic chocolate, what would you highlight about your evolution and current concerns? The two books are indeed very different from each other. 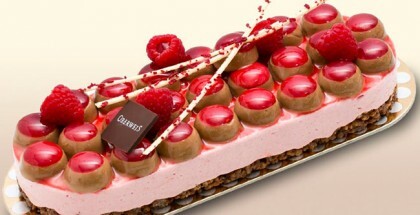 Matière Chocolat was made 10 years ago with a vertical view of pieces; much more classic and floral. But above all, after 10 years of practice in everything and nothing, in what may involve daily practice, I have better knowledge of the material and of oneself, reflection, rethinking, frustration, encounters, journeys, experiences, fatigue, envy, and the freedom of interpretation, the difference, the exchange, maturity, sobriety, blue, simplicity … And mixing all this, has resulted in Bleu Chocolat. Your book highlights a display of techniques. How have you organized this part of the work and what do you think will surprise readers the most when they encounter it? The technical book is divided into four different parts. The first one reviews all the material and elements that I use in the making of my pieces, and includes the mold making techniques, planks, and other specific materials. The second part is dedicated to reflection, study, and other work prior to the realization of different parts structures. The third part is oriented to the floral and plant realizations. And finally, the fourth part presents the effects of materials. Technical and technological advances such as 3d printing place the artisan before a world of new possibilities. How do you think these changes influence how you approach chocolate and what is seen in the book? Indeed, high technology has reached the pastry and chocolate shops. I think we can put it at our service although I’m not a big user in my artistic work. I love the contact with the material with which I work, that aspect is essential for me. However, the use of certain technologies would mean reaching new artistic possibilities if they are known to be used for that purpose. For example, a pressure cut from a machine that cuts in your place offers greater precision and cleanliness of work, in addition to a considerable saving of time. Therefore, when used well, it can bring a great added value to your achievements. On the other hand, creativity remains essential. For my part, this gives me many ideas for development and then I can see various applications and, in the end, the machine will only do the cutting. This also implies an important investment that is not necessarily available to everyone. Do you think that the chocolate sector is taking advantage of these advances? Do you perceive it in elite competitions? Sometimes it gives the impression that precisely this artistic part is much more abandoned than the rest. The technical innovations suppose above all a saving of time – like what I explained with the pressure cut. 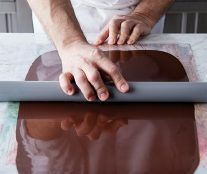 That is why I would say yes, that certain “chocolatiers” can take advantage, but that will also depend on the way in which they want to evolve the profession permanently. As far as competitions are concerned, I think we still need to work on the matrix of techniques that can also be used as well-known technologies but watching that contact and mastery of the gesture that in my eyes are essential for the survival of the trade. 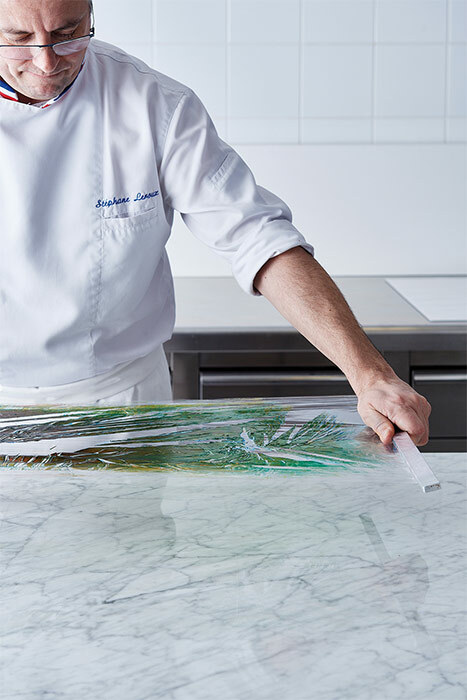 Generally, one knows why a restaurant receives its stars or why certain pastry shops propose high quality products, nothing is left up to chance and the professional occupies an essential place at that level. Let’s try to keep this spirit and we will preserve a future that we can propose to those who are younger. 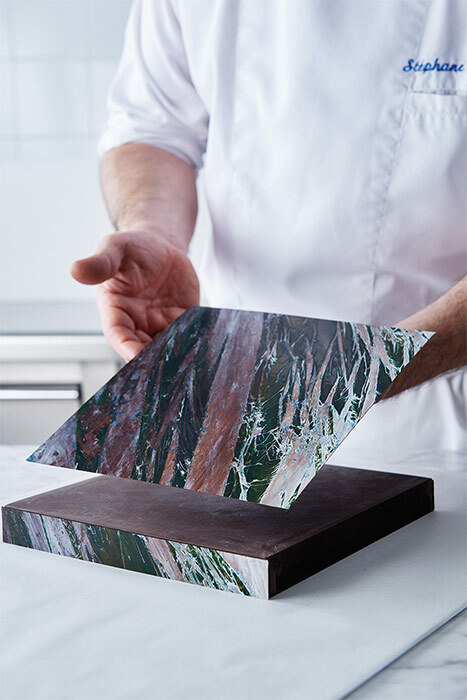 The second volume of Bleu Chocolate is all about step by step techniques, like these images from the marble effect.